Small but tough and can pass through a normal doorway - ideal when working with restricted access. The highly versatile 1.5t mini digger is ideal for those requiring performance and transportability. Compact stylish mini excavator designed for powerful dig performance with massive operating capacity. Micro & mini diggers for hire in Bury, Haslingden, Rawtenstall, Rossendale, Ramsbottom, Helmshore, Tottington, Bacup, Accrington, Baxenden, Edenfield and Radcliffe. Our mini diggers are suitable for a wide range of groundwork including footings, drainage, driveway preparation, block paving, general landscaping and general groundwork. We hire out excavators ranging from 3/4 Ton to 3 Tons, with the smallest digger measuring just 70cm wide, enabling you to access areas usually worked by hand. You can hire any of our mini diggers with or without a driver and we can arrange self drive insurance if required. Arrange to rent a mini digger from us and you will receive a first class service from start to finish, all at an affordable price. Call now for more information on 01706 831 248 or contact us online. Our 0.75 ton, 1.5 ton and 3.0 ton mini diggers can be delivered direct to your site even at short notice. You can hire any of our mini diggers with or without a driver. Our prices are very competitive so call today! 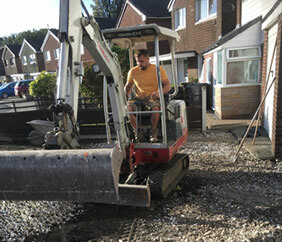 Based in Bury, Lancashire Plant Hire offer mini digger hire in the Lancashire areas of Bury, Haslingden, Rawtenstall, Rossendale, Ramsbottom, Helmshore, Tottington, Bacup, Accrington, Baxenden, Edenfield and Radcliffe. Our micro diggers, 1.5 tonne diggers and 3.0 tonne diggers are available to hire on a long or short term basis, with or without a driver. Lancashire Plant Hire Ltd offers a superb choice of mini diggers at the most competitive prices in Lancashire. We now also offer dumper hire, septic tank installation and drainage and groundworks throughout Bury and Lancashire, all at affordable prices, so why not get in touch today?